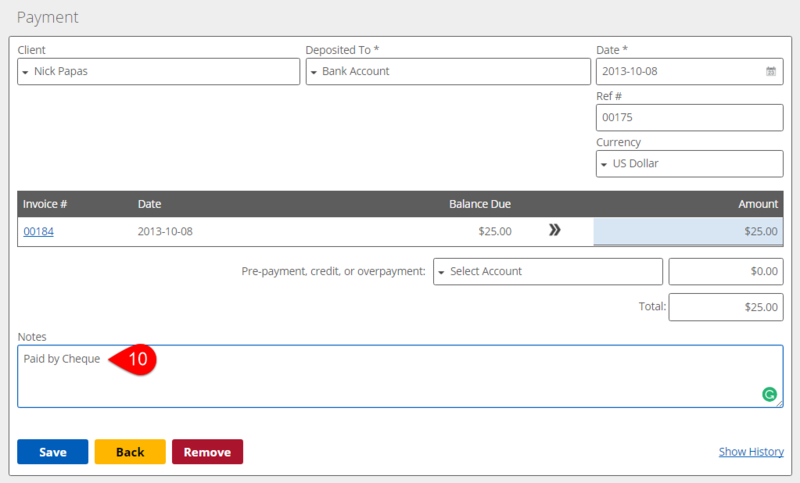 Find what you are looking for by using the search box, which can be found in transaction lists on pages (like the Income, Expenses, and Transactions pages). Simply type in one or more search terms into the search box and press Enter. Transaction Amount: Enter a search term like "1000" to match records with a total due of $1000.00. Hint: Make sure to search for the exact dollar amount, like "1000.00", not "1000". You need to include the two digits after the decimal point as well as the quotation marks. Date: Enter a specific date in the format specified within your Business Profile page. For example, if your date format is set to YYYY-MM-DD, you would type in 2013-10-15 to pull up transactions for October 15th, 2013. You can also search by entering a year, like 2013. Entering a month name, like November or Nov will match records from that month in any year. If you want to search by both month and year, type them both in like January 2013 to search for all transactions for January 2013. Lastly, if you want to search a range of date, you can enter in date range using the format of [YYYY-MM-DD YYYY-MM-DD] (assuming that the date format in your business profile is YYYY-MM-DD). So, you'd type in [2013-01-01 2013-01-15] to search from January 1st, 2013 to January 15th, 2013 (this would include dates from January 1st and January 15th as well). Hint: Don't forget the [ and ] brackets. Customer or Supplier Name: Search by typing in the name, like Nick Papas. You can also search by only part of the name, such as Papas. Description: This is the description you fill out as a line item on income or expenses. Category: The names and numbers of the accounts in line items (like income or expense accounts) are matched. 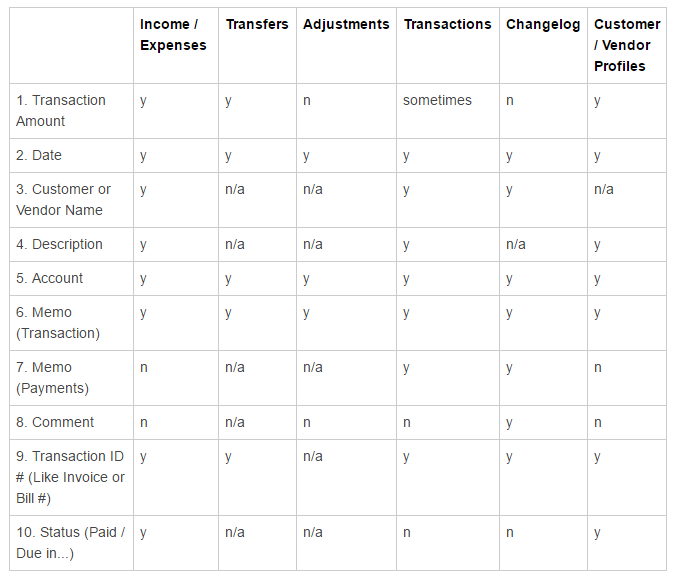 Memo (on Transactions): The memo field used in transactions (except payments). 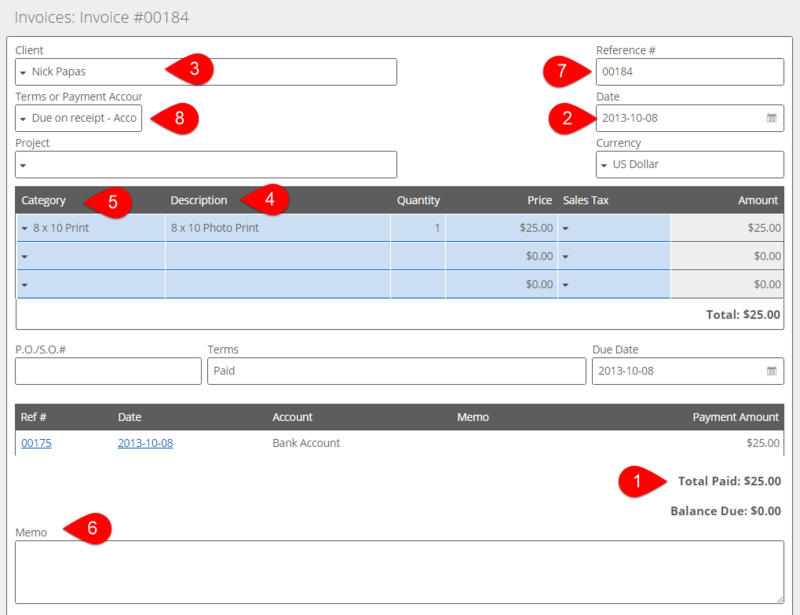 Reference # (like an Invoice or Bill #): Type in the ID, like 00810 for Invoice 00810. Hint: Make sure to type in the full number 00810 instead of 810. Comment: If you have left a comment on an invoice, and that comment contained the words you are searching for, it would be included in the list. Notes (on Payments): The notes field you use when making payments. Hint: If you're searching for anything that is text based, like a name, you must entire an entire word into the search (i.e. either the entire first name, last name, or both the first and last names). For example, if you're searching for the name Nick Papas, you have to type in at least Nick or Nick Papas . You can't type in Nic as this won't bring up any results. However, if you do want to search for partial words, you can add the * modifier at the end to do so, like Ni* to pull up all results starting with Ni. Here's a complete list of what you can search for on specific pages.